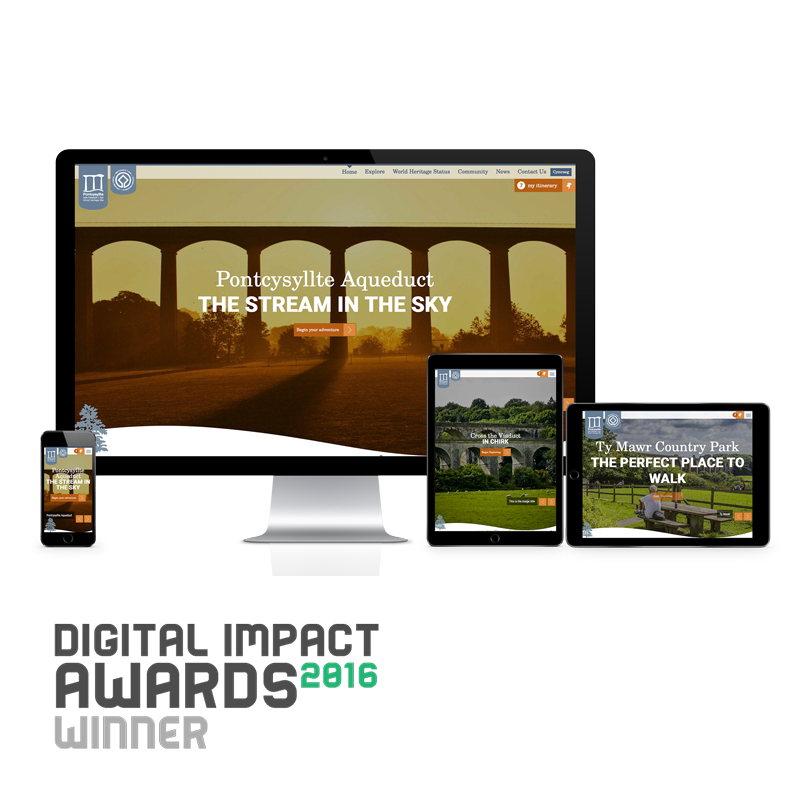 In early 2016, Wrexham County Borough Council appointed Connect to design and build a new website for the Pontcysyllte Aqueduct, with a view to it running in tandem with five digital kiosks located at tourist hotspots across North Wales. Feedback from visitors and the local community, paired with rising demand gave Wrexham Council motivation to develop a synchronised platform that would not only reflect visitor access, but the community and history of the site. Taking in 11 miles of outstanding natural beauty, the Pontcysyllte Aqueduct & Canal was designated as a UNESCO World Heritage Site in 2009 and has developed into a popular destination with international appeal. We were tasked with developing a mobile-friendly, bilingual website that is easily maintained through an intuitive content management system. The site also had to amplify content, encourage engagement and highlight social media actvity to aid internal strategy. The project’s discovery phase helped all parties gain an understanding of objectives and helped to address any underlying issues, thereby defining the requirements for the design and build. We conducted a number of stakeholder engagement workshops in order to define user journeys. These workshops helped Wrexham Council to understand who is going to be using the platforms, set measurable goals and monitor performance. The workshops also helped to inform usability, navigation, information architecture and feature development. Upon arrival, the homepage displays dynamic content to the user – taking them on a journey that encourages exploration of events and activities – one of the steering group’s key aims for the project. 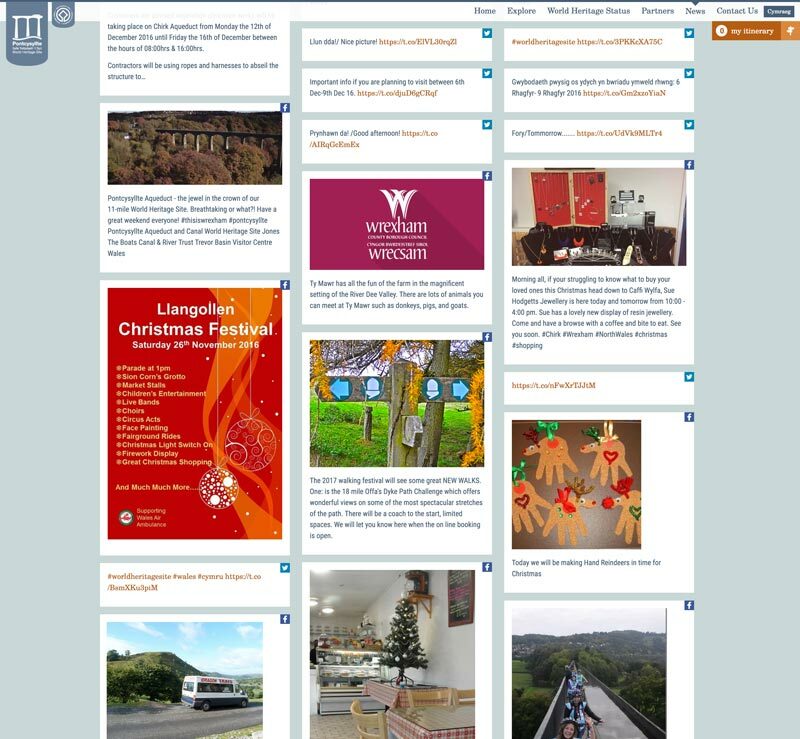 The ‘Latest News’ section pulls in posts and visuals from Pontcysyllte’s social media platforms, giving users a snapshot of what’s on offer in North Wales. This feature is powered by our own in-house plugin. With over 3 billion social media users across the globe, we appreciate the need to get our client’s social updates on to their website and seen by as many users as possible. 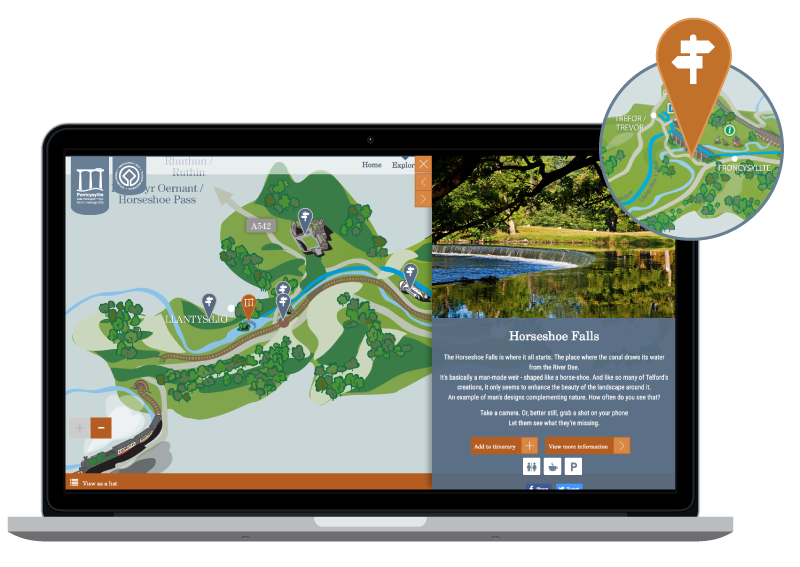 The site features a map interface that allows users to discover activities and points of interest in-and-around the World Heritage Site, with the ability to add items to a personalised itinerary for further reading. This feature has played an integral role in the success of the project and continues to drive visitor activity. Given the diverse range of visitors to the World Heritage Site, it was particularly important that any barriers to entry were removed, with an accessible experience presented to all. The site was designed with accessibility in mind, and is WCAG 2.0 Level AA compliant. To ensure seamless delivery of content, we approached publishing with a single source. This safeguards information and provides a consistent experience, whether visiting via the website or kiosk. With this in place, the need for updates has been reduced, dramatically reducing overheads for editors. The biggest advantage, however, is that the kiosk runs a standard browser in a ‘kiosk mode’, with content pulled in on demand. This significantly reduced the complexity of the solution, as it removed the need for dedicated feeds and apps. The response to the project has been incredibly positive, with the platforms picking up the ‘Best digital rebrand’ award at the 2016 Digital Impact Awards. 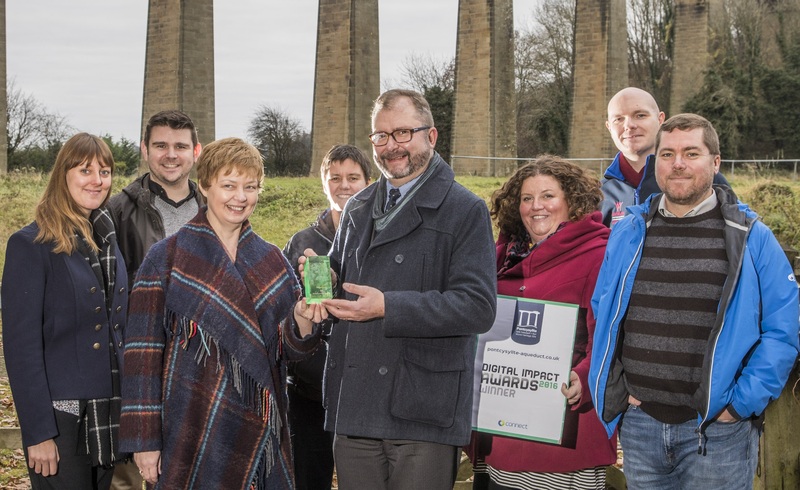 A blend of high-impact visuals, interactive technology and a sophisticated content management system has given new life to the Pontcysyllte Aqueduct on digital, and we look forward to seeing where they go from here. We continue to provide support and maintenance services for the platforms to ensure continuous uptime and an optimal user experience.